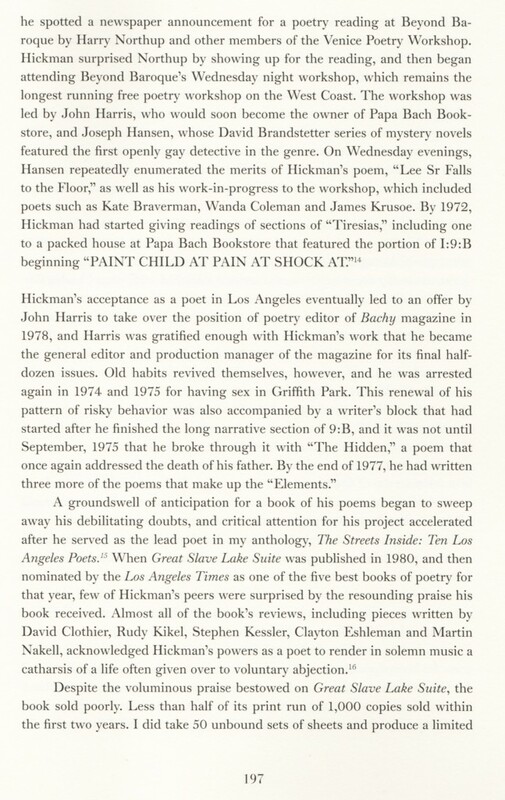 I met Lee Hickman at the Beyond Baroque Wednesday night poetry workshop in late 1971. By the late spring of 1973, I was driving across town on my Honda 100cc motorcycle to visit him at the house he shared with Charles Macaulay. The house itself was owned by Raymond Burr, the actor best known for playing rogue lawyer Perry Mason on television. Lee had a small workroom towards the rear of the house, and we would talk about our poetry and our current reading. 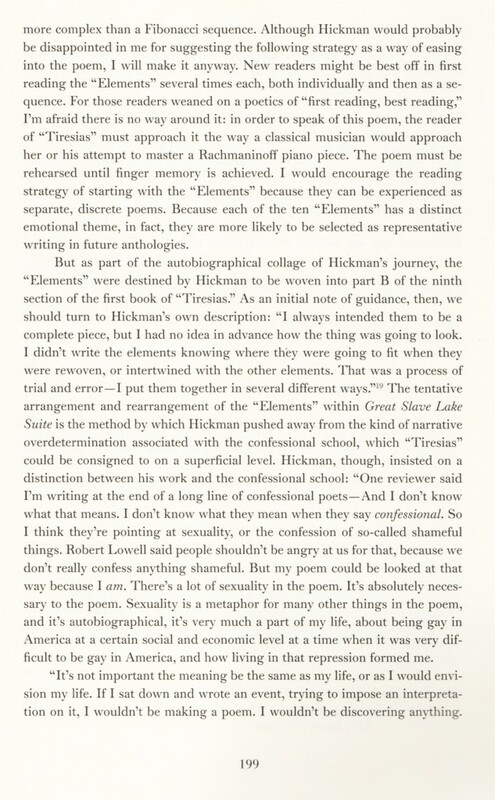 I first published his poetry in the second issue of BACHY magazine in 1973, but I had turned the poetry editorship over to John Harris shortly after that issue came out and decided to start my own magazine, MOMENTUM. 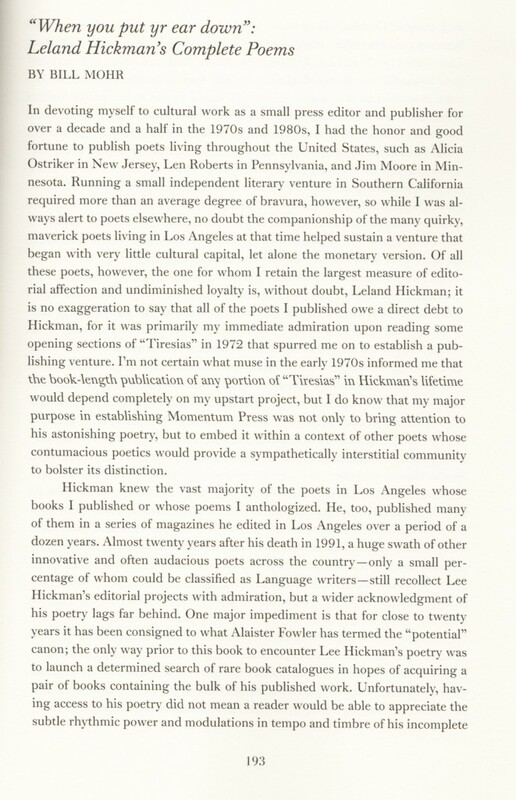 Lee’s poems were featured in issues 1, 2, 4, and 5. By the time the fifth issue came out in 1975, I had decided to start publishing books, too, and the appearance of books such as Holly Prado’s FEASTS in 1976 and Jim Krusoe’s SMALL PIANOS in 1978 certainly reassured Lee that I would be capable of serving as the producer of his first book, whenever he finally brought it to completion. 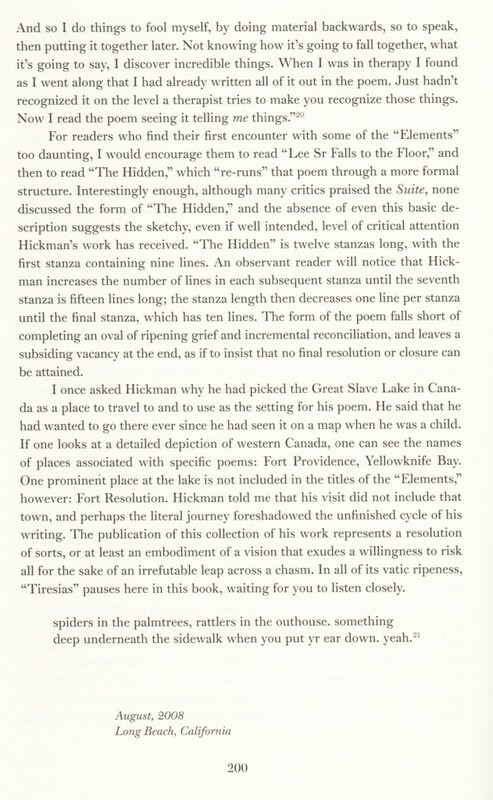 GREAT SLAVE LAKE SUITE: Tiresias I:9:B was published in 1980, and Hickman’s book was one of five nominees in the poetry category for the Los Angeles Times Book Awards. After his death, I continued to speak up for the value of Lee’s poetry, though fewer and fewer people seemed to be interested. At one point early on in the first decade of the 21st century, Suzanne Lummis said to me, “Ah. Lee Hickman. Nobody talks about him much anymore.” And it was true. 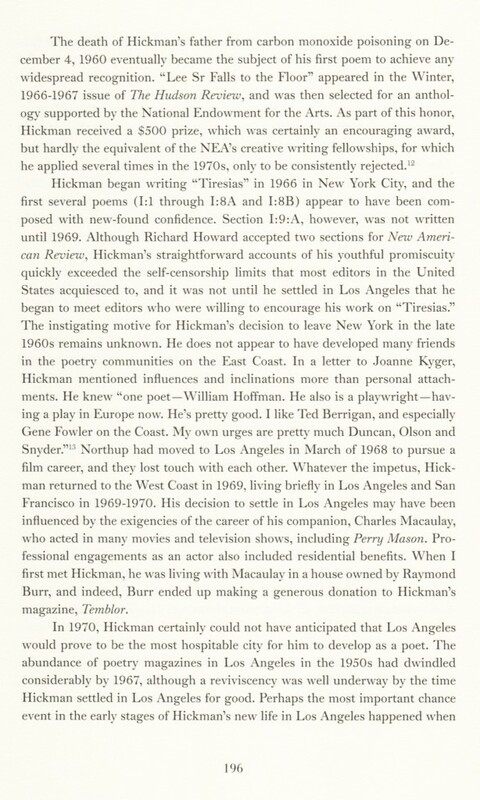 Still, I persisted, and when I found myself at an event at Poet’s House in New York City in 2005, I took advantage of a conversation with Stephen Motika to cite Lee’s work as a neglected masterpiece that deserved restoration. Stephen had not known of Lee’s poetry, but when he did have a chance to read it, he immediately recognized its authority. 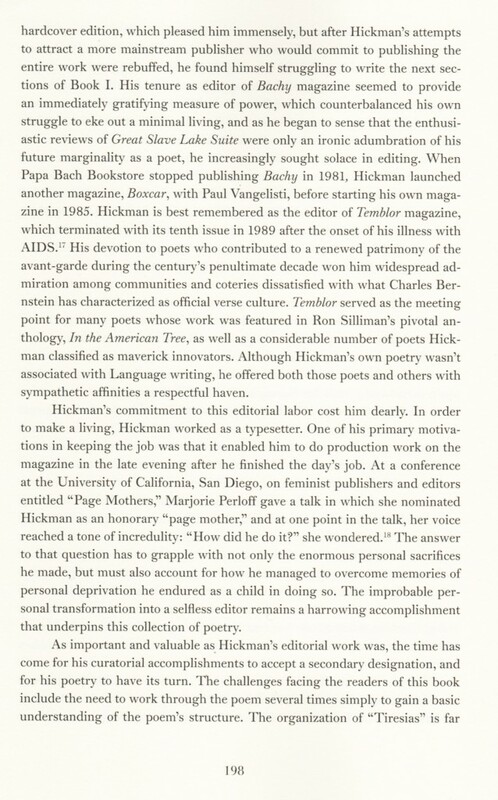 He set about putting together a manuscript that would constitute a Collected Poems. Both of us went together to the UCSD Special Archives and took notes, and then compared and assembled our list of possibilities. 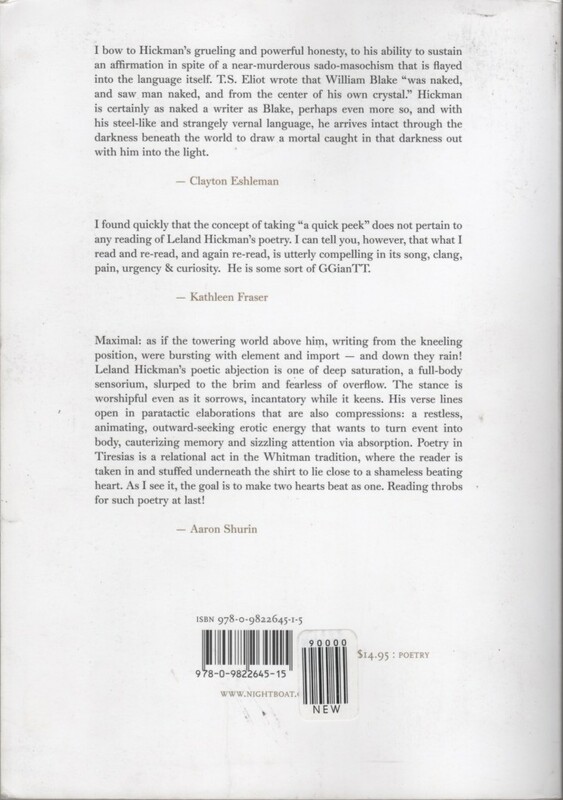 By the summer of 2008, I had written an afterword, and Dennis Phillips had written a very fine introduction. 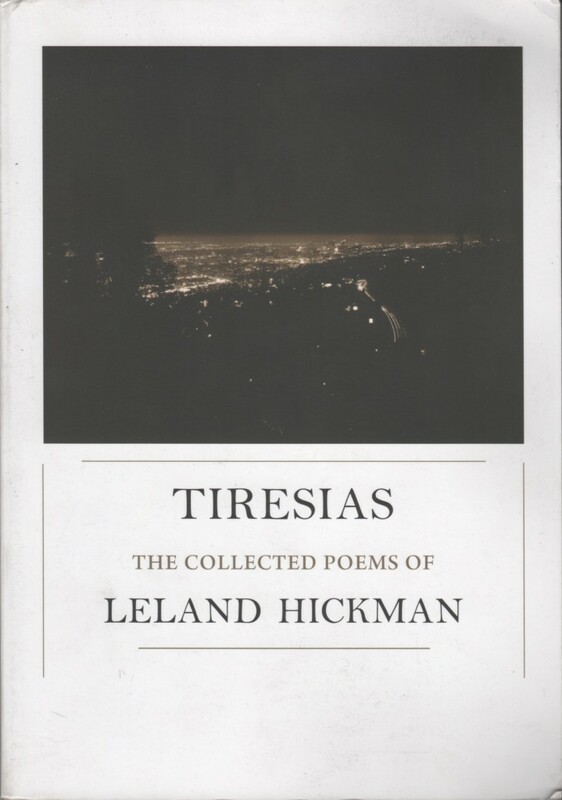 TIRESIAS: The Collected Poems was published by Nightboat Books in 2009, followed by an exhilarating group reading and celebration of Lee’s posthumous collection at St. Mark’s Poetry Project. 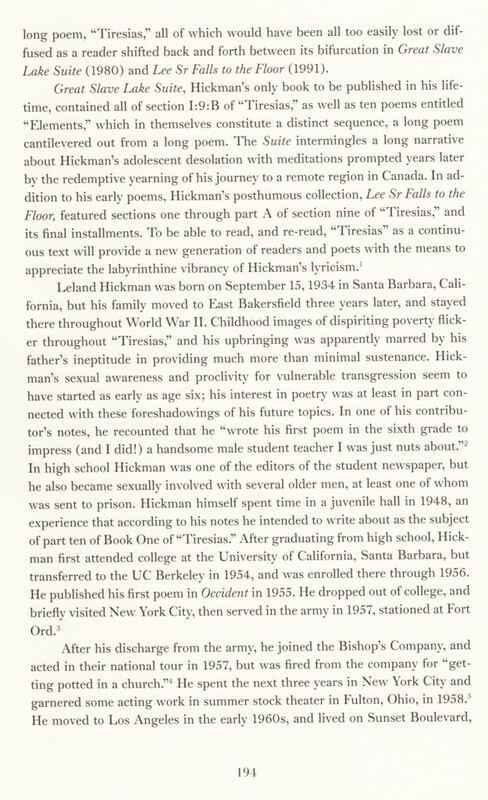 I attach my afterword to TIRESIAS as a way of giving young poets who are just now in the process of forming their own canon of 20th century American poets an introduction to one of its most tantalizing shapeshifters, Leland Hickman (1934-1991). Posted on March 10, 2016 by billmohr. This entry was posted in Books. Bookmark the permalink.